Greetings Cottage Friends! Allow me to introduce myself. My name is Brewster Cogburn Rabbit, G.B.I.T. (Garden Bunny In Training), but you can call me Brewster. I'm the Cottage Lover's new garden assistant. That woman has been crazy busy of late, so she's given me the task of journaling all the garden happenings at A Joyful Cottage. Which is fine with me, because writing is part of my DNA. My great grandfather Peter learned a lot about writing by observing Beatrix Potter at work, and everything he gleaned he passed on to my grandfather, who passed it on to my father, who passed it on to me. Anyhoo, CL (short for Cottage Lover) found me hiding in a box The Artist (that's her husband, you know) had packed for the community thrift store. 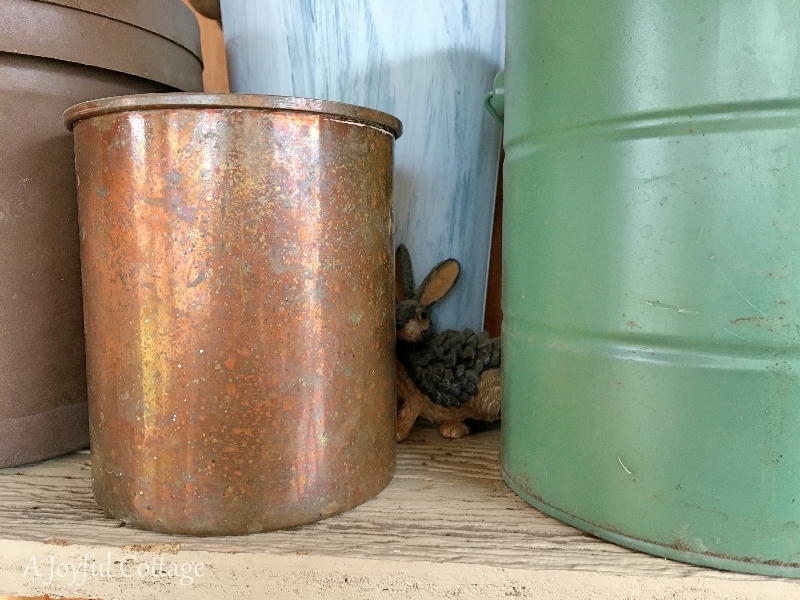 She rescued me, and now I reside in the potting shed. Kind of a mascot, if you please. hoping she won't see me. I mean, come on, a guy needs his rest. Before I take you on a tour of the garden, I need to file a complaint about my lodging conditions. The potting shed has been pretty cramped lately thanks to all of CL's projects. Holy carrots that woman has a lot of those! Projects I mean. 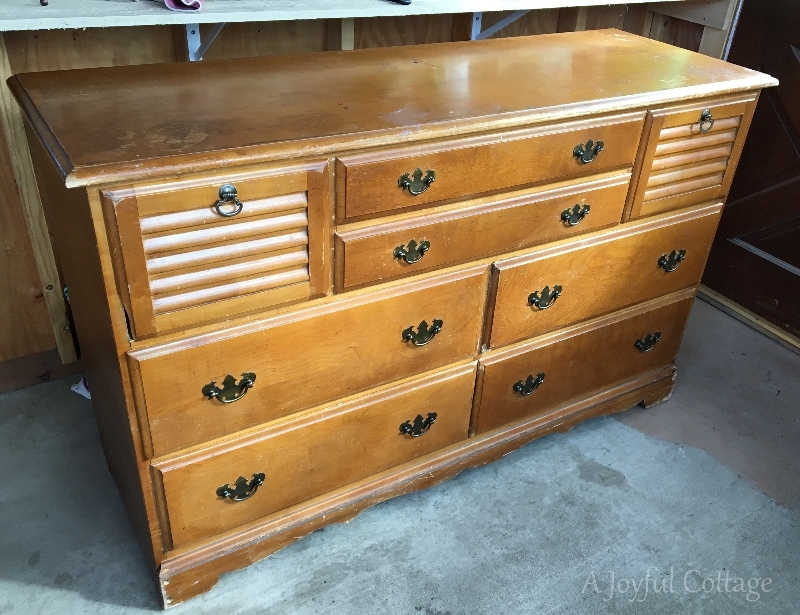 Do you remember this old dresser she showed you a couple of weeks ago? That thing was a mess. She sanded down the top and stained it dark walnut, mixed up some chalk paint using leftover paint in a color called Natural Canvas and gave the base three coats. Distressed it a bit and rubbed on a clear wax over the whole dresser (two coats on the top). CL's been smiling a lot since she finished it, so I guess she's pretty happy with the outcome. I'm just happy that she got it out of the shed! But then (sigh), as soon as she finished the dresser, she started on this second hand white bathroom wall cabinet that she picked up in Pendleton, Oregon for $35. It came with pretty glass knobs that she had already removed when this photo was taken -- just before she started painting. I pinky promised not to tell what color she's painting it. Painting Schmainting, let's move on to my favorite subject. . .the garden. After all, I am a G.B.I.T. Besides, I'm afraid if I hang around in the shed too long I may end up staring into the bristles of a paint brush. One never knows what CL's going to paint next! 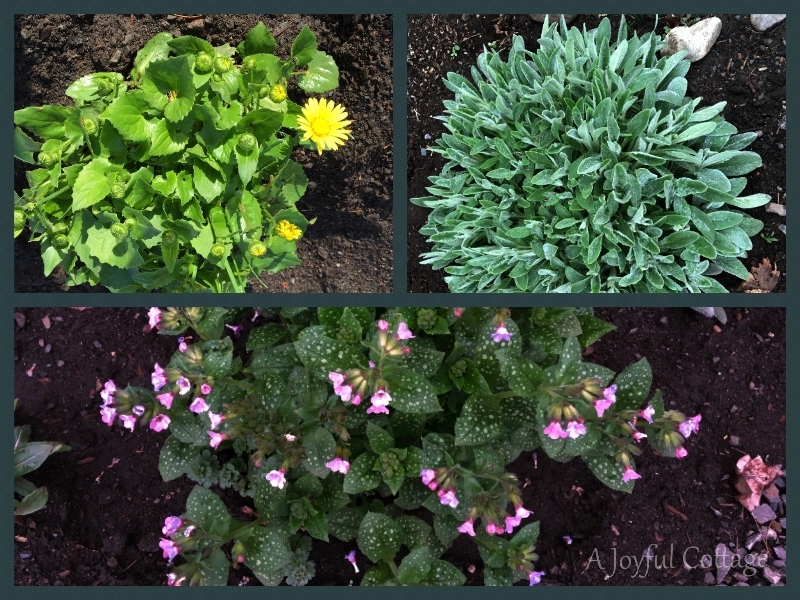 The perennial beds survived the winter and the early bloomers are strutting their stuff. The Artist has made progress on the berm, reusing the rocks he digs up to create little walls and add to the dry creek bed. And he's digging holes for planting trees. Eventually all that black plastic will be covered up. 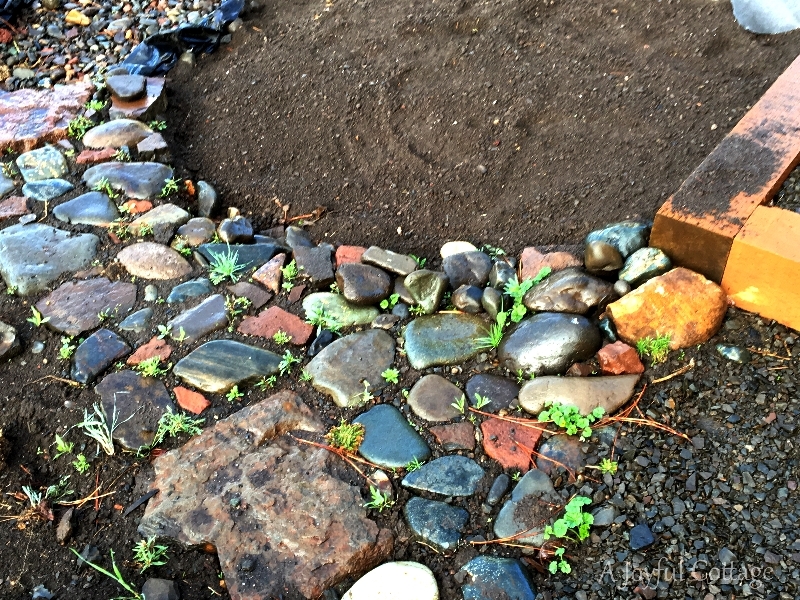 CL loves this stone path and wants to plant a low growing creeping perennial in the gaps. Anyone have a suggestion? Back in the potting shed CL has some Vinca ready to plant for ground cover. Thanks to the big windows The Artist installed in the potting shed, CL can get a head start on the growing season. 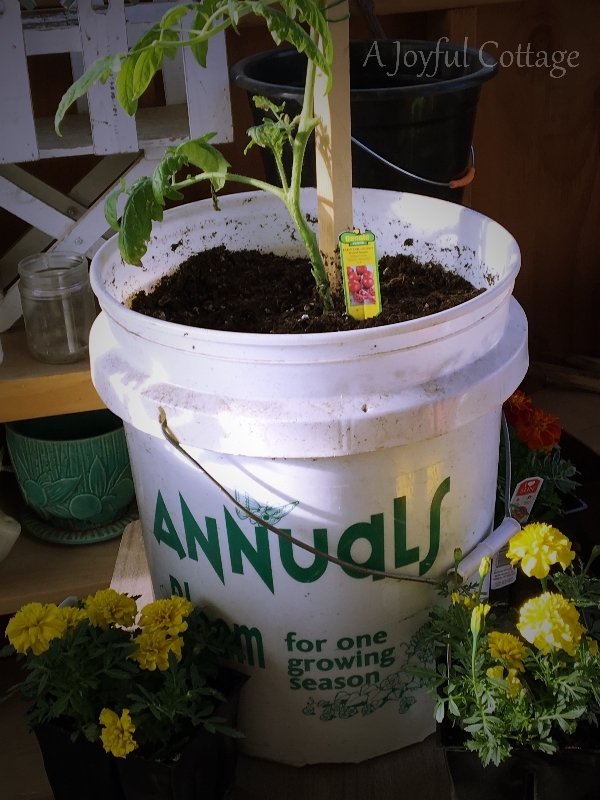 She had pretty good luck with growing tomatoes in 5-gal buckets last year, so she's trying that again. 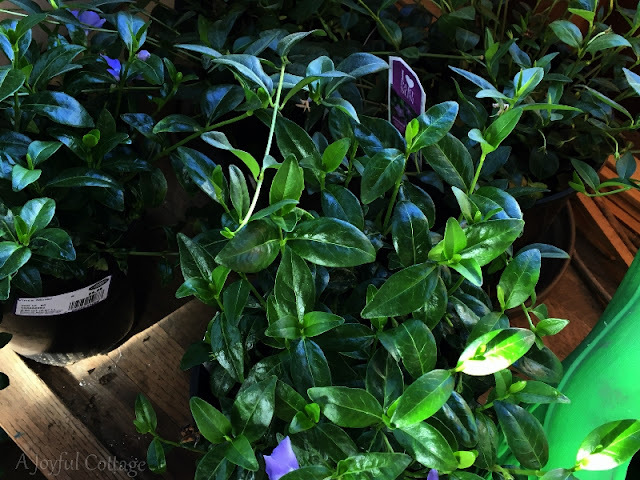 Speaking of growing things in a container, CL wrote an article on container gardening for Yes! Communities' newsletter. She's partnering with them as a guest writer sharing tips and ideas for beautiful small home living on a budget. If you're interested, you can read Container Gardening 101 here. Thanks for hopping along with me today. And remember, hare today, gone tomorrow (sorry, I couldn't resist). The opinions expressed in this article are the bunny's own and may not necessarily reflect the views of A Joyful Cottage management. I love the post and especially Brewster. You did a beautiful job on the dresser. I will be painting ours when the weather warms up along with some more furniture. Brewster, I'd be a bit wary of the paint brush, too. As long as CL has a bit of furniture to paint, I'm pretty sure you are safe. The garden looks lovely - keep up the good job of supervising the work of the Artist and CL. Hi, there, Brewster. I'm so glad to meet you. CL is a dear lady and she's worked hard to get her little cottage ready for the gardens this Spring. I'm so glad she has you to help out. Be kind to her - I know she will be very kind and gracious to you! Thanks for telling us about the article she wrote. Give her a hug for me. Here's one for you, too! Happy to meet little Brewster. What a cute little helper. Everything is looking so good. Love the way the dresser came out. Just beautiful. Very cute. Love everything going on, especially the redo on the dresser. I used thyme (wooly) in my yard in Bend. You could also use creeping thyme, or probably any thyme you want. I think the zones would be about the same?? Anyway, everything's looking great! 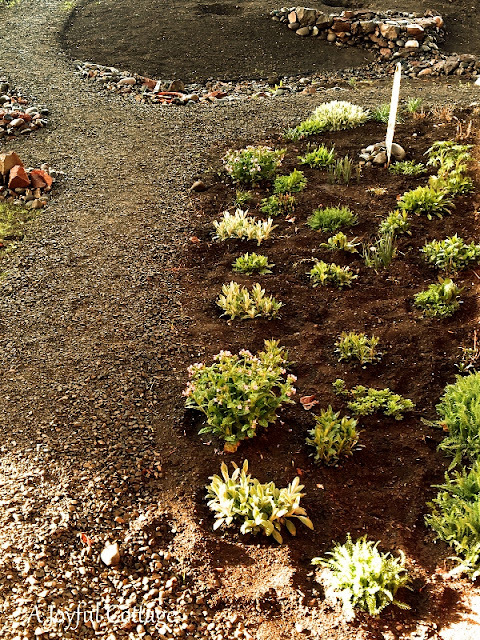 How about planting creeping thyme in your path? Lemon thyme is one of my favorites because of it's scent. Hi Brewster and Nancy!! What a fun post to read of all the wonderful things you have been up to!! Things are coming along nicely in the garden and the painted projects look great!! Take care! Hi Brewster, Thanks for the introduction! You might enjoy meeting Eleanor Elizabeth who lives at Willow's Cottage although she's a wool bunny. You might suggest creeping thyme to CL to plant in the pathway. Lovely changes Nancy and please tell Brewster he told his story well. Lots of delightful happenings in that potting shed isn't there Brewster?! Dresser looks stunning and wow thats a lot of planting you did. You nurture nature beautifully. So nice to meet you Brewster. I look forward to many more tales. I trust you will behave and not munch on all CL's plants as your cousins do over at my place. Well, good morning to ya, Brewster!!!!!!!! YOU are so tiny and cute and good thing CL rescued you! You are great to have around when she's too busy to write to us! Such a wee rabbit with a big job!!!! 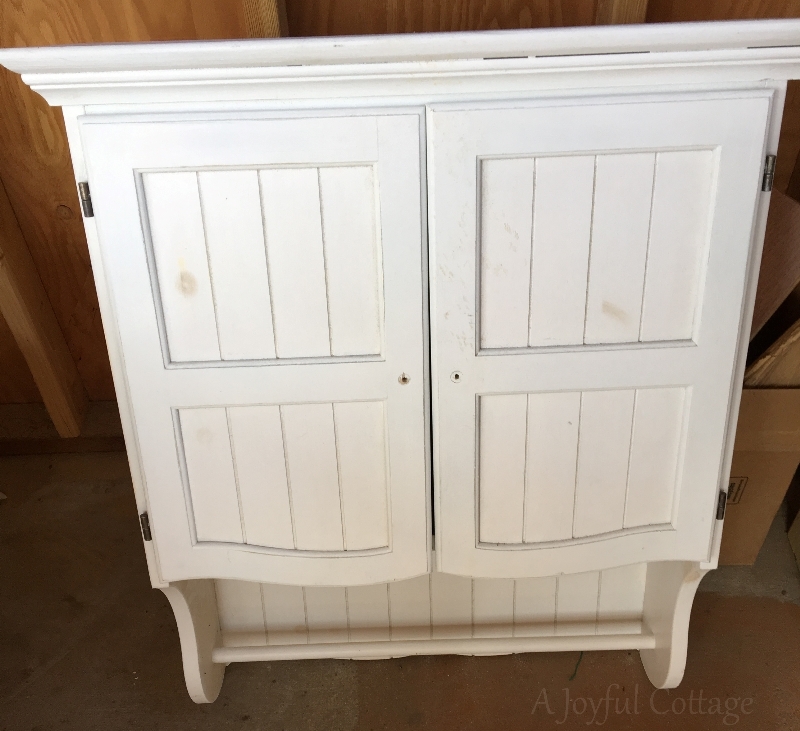 LOVE, LOVE, LOVE that distressed dresser and the little cabinet. 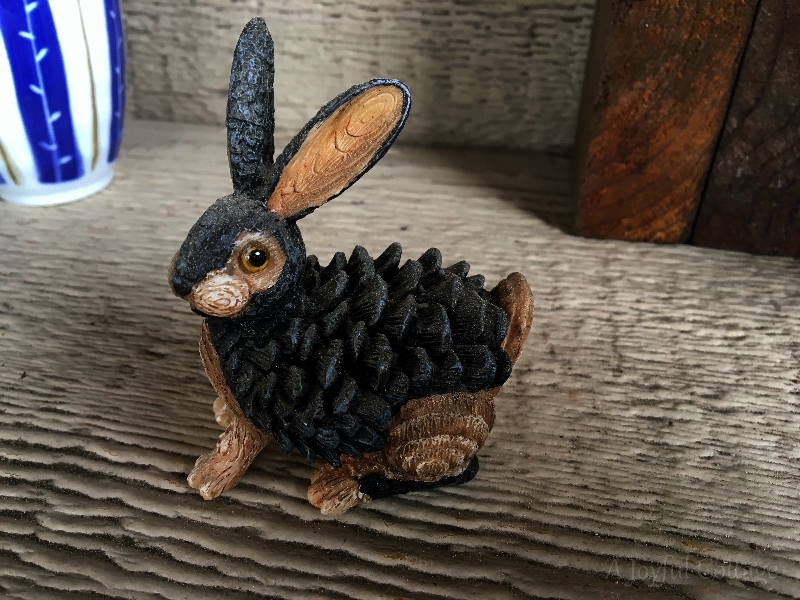 The cottage is shaping up into the perfectly detailed dwelling INCLUDING a tiny rabbit with a personality. Every cottage needs such a mascot. Adorable. What a cute post! 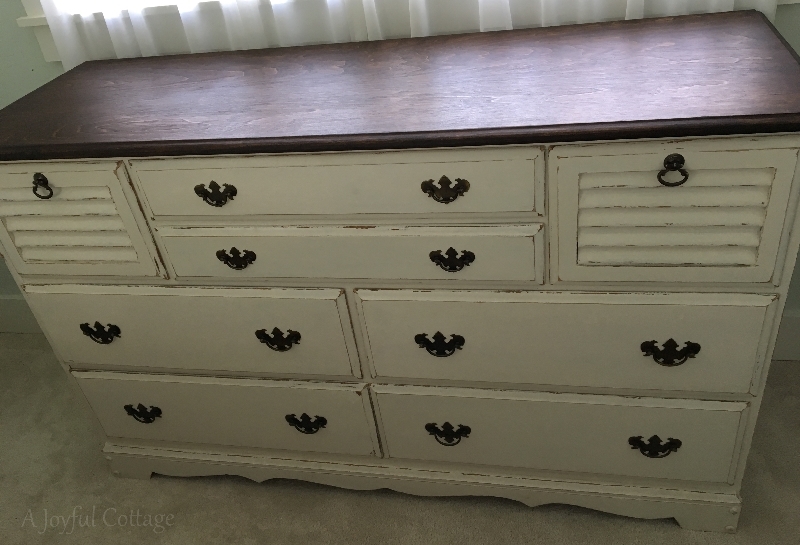 Love how the dresser turned out and look forward to seeing what you do with the other piece. 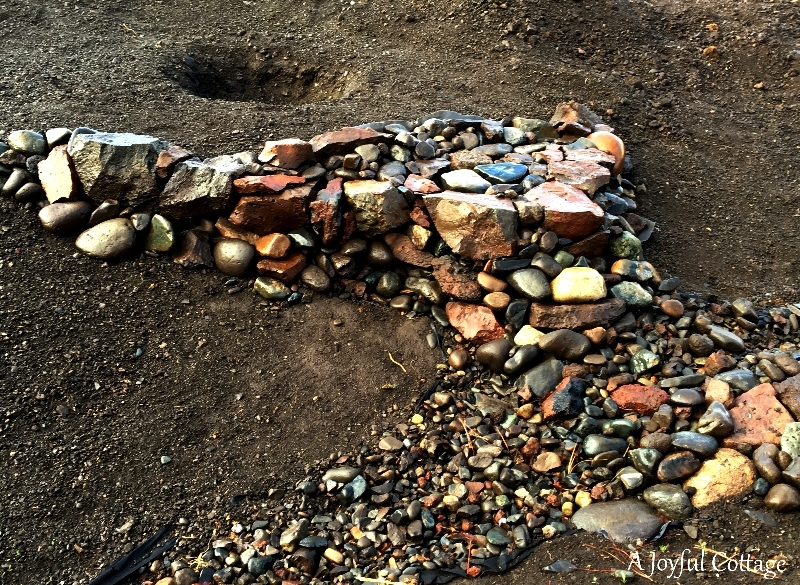 Your gardens are looking good, love your rock paths and walls too. Will check out container gardening 101. Brewster is adorable and I am so glad you rescued him! Your dresser is gorgeous! Is it for you to use or are you selling it? I love your rock accents and your plants are looking good. I am so anxious to get out in my garden but it is not to be yet. It is 27 degrees here now. This weekend is supposed to be near 70 but we are going out of town...it figures!! What a delightful little friend to welcome you each time you "head for the shed"! I am so glad that you rescued him, he is perfect to bring a smile. Love the outcome of your dresser--b--eau---ti-fullll! Anxious to see the bath room cabinet---looking forward to its unveiling with great anticipation! Brewster, please tell CL that the painted dresser looks amazing! I enjoyed your round up of what CL and the Artist are up too. I will be away on Spring Break...catch up with you soon. Hello again, Brewster!!!!! I SAW one of your counterparts finally, in my garden yesterday! It was funny; I was just thinking how we have not seen our sweet bunnies in so long. My husband has been out of town, and arrived yesterday, and as he come home through the garden, THERE WAS THIS RABBIT! It's as if the rabbit was on the welcoming committee for him! 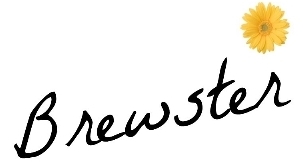 Loved the post . . .you are adorable Brewster . . . Hiding out there amongst the gardening things . . . I am seeing the "likes of you" around here too . . . Pass it on, that chest is looking mighty fine . . .
"Little red cottage" will be happy to "house it" I am sure! Somebunny has been busy! And you, Brewster, definitely can keep a secret. It means I'll have to hop back to find what color that sweet little cabinet will become! Looks like CL and The Artist are making good progress on the landscaping...It will be fun to watch it take further shape and mature. ♥ till next time. What fun! Brewster is so sweet. Love how your dresser turned out and I can't wait to see what color you paint the cabinet! And I'm looking forward to seeing how your garden develops. It's looking great so far! Hooray for spring! !